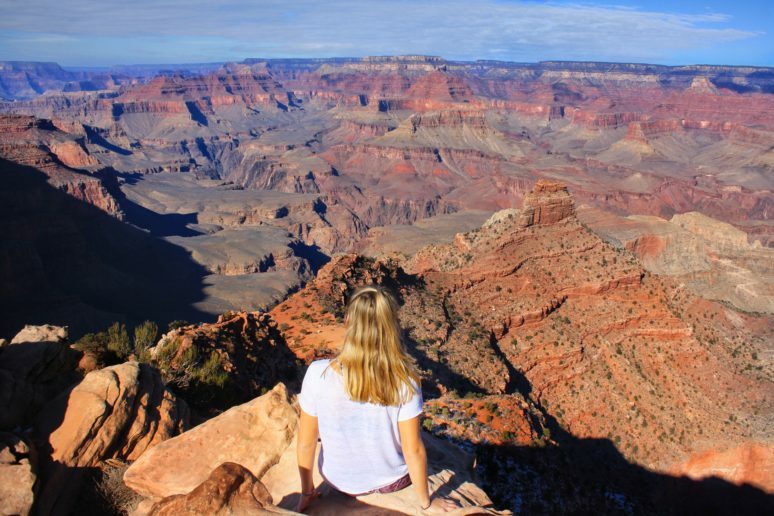 There is nothing quite like your first visit to the Grand Canyon in the United States – the sweeping panoramic views, the majestic nature, and the variety of hiking trails. It’s a photographers dream location! After arriving into the Phoenix Airport I quickly grabbed my backpack and reunited with some friends in Arizona. We began the 4 hour drive to the Grand Canyon from Phoenix and arrived around nightfall, giving us plenty of time to plan our three days of touring. 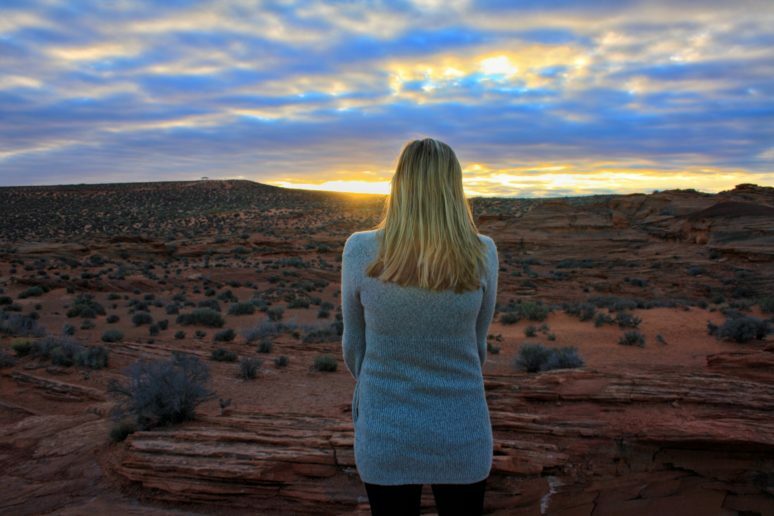 Here are my tips for the top 3 places to visit in Northern Arizona! Horseshoe Bend is located about an hour north of the Grand Canyon in a sleepy town called Page, Arizona, close to the border of Utah. 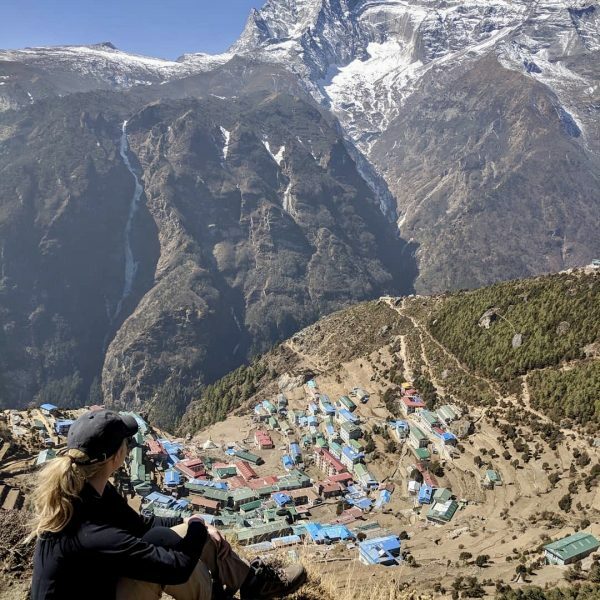 Before planning the trip I knew very little about the famous sights near the Canyon so I consulted a lot of travel bloggers to help plan my trip. 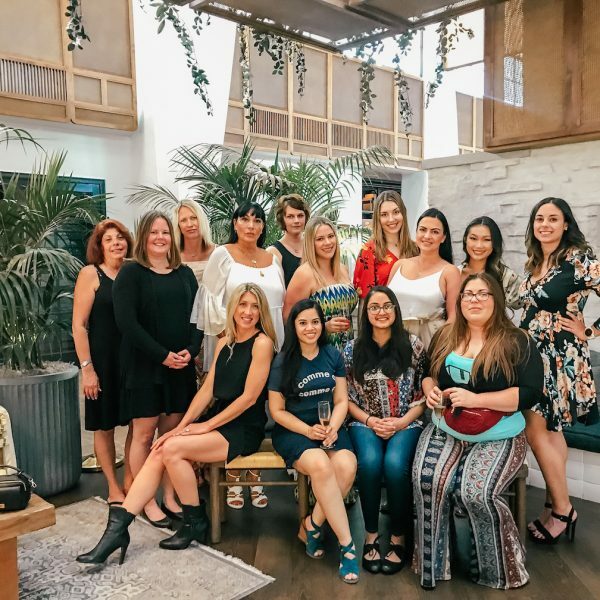 We Are Travel Girls has an in depth post on the Lower Antelope Canyon Tour and Alex in Wanderland has a post on the Grand Canyon. Ultimately we decided to wake up early to see Horseshoe Bend before the influx of tourists come to take photos. Horseshoe Bend features a 270 degree curved view of the Colorado River. The river flows from the right side of your view, completely around the bend, and exits to the left. The orange rocks are Navajo Sandstone, aka sand from the Jurassic age. Contrary to it’s name, sandstone is actually extremely thick (up to 2000 feet) and is quite safe to walk around. The danger lies where the exposed rocks lay on the tops and sides, so signs warn visitors to be careful on the ledges of the canyon. 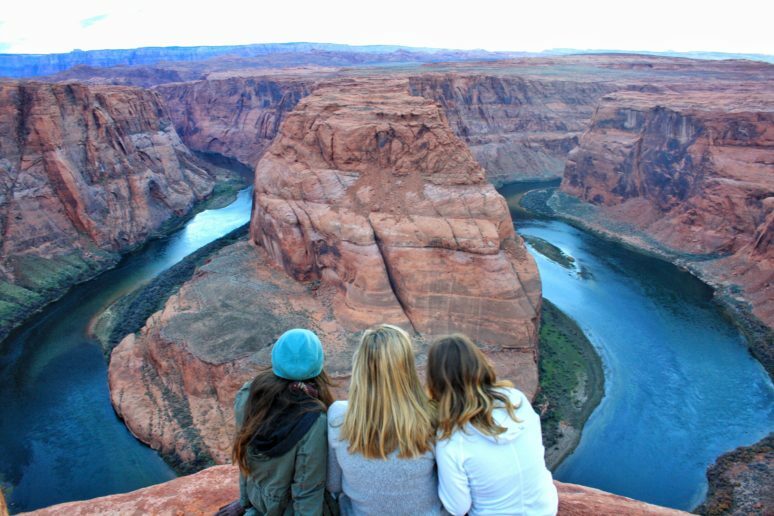 The absolutely stunning views are so majestic they almost seem fake, and seeing the view in person is the best way to take in the full beauty of Horseshoe Bend. By the time we left the canyon there were tons of tourists with cameras and the best photo spots were overrun with people. I’d recommend going early, bringing a camera and tripod, and enjoy watching the sun rise and illuminate the majestic sandstone colors. There is not much hiking available near Horseshoe Bend so you have plenty of time to see both the bend and Antelope Canyon in one morning. After seeing Horseshoe Bend we quickly checked out of our hotel and drove 15 minutes north of Page, Arizona to the Lower Antelope Canyon Tour (there’s also the Upper Antelope Canyon Tour). The canyon is located on Navajo land and is therefore only accessible through guided tours. The upper and lower canyon boast very different views but we decided to see the lower canyon based on recommendations from previous visitors. There are only two tour companies that run 1 hour tours of the canyon. You can take a guided tour for $20 (plus an $8 entrance fee to the reservation) or splurge on the US $50 photography tour. The 1 hour tour gave us plenty of opportunity to take photos of the canyon and hear about its history. The main difference is that the photography tour starts in the opposite direction, giving viewers more unobstructed views of the canyon. In the wintertime there are not many tourists, but the guides can do upwards of 15 tours a day for large groups during the warmer months and a photography tour would be highly recommended for anyone looking to take professional photos. 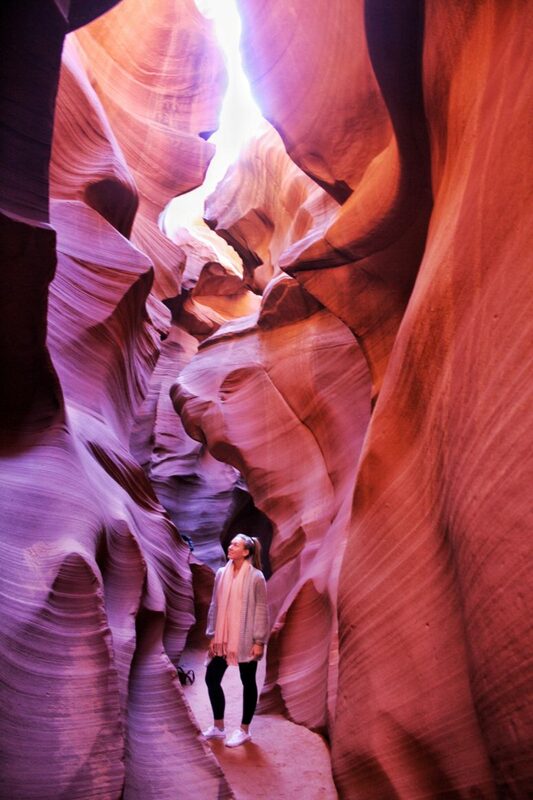 I could not speak more highly about the Lower Antelope Canyon Tour. Our guide taught us so much about the history of the Native Americans on the land, how the canyon formed, and when it grew in infamy (Microsoft Office background ring a bell?!. For only $20 it was a real bargain and a once in a lifetime opportunity to see the beautiful beams of light and deep colors present throughout the canyon. Make sure to time your visit for when the sun high in the sky. After spending the morning at Horseshoe Bend and Antelope Canyon take the two hour drive down to the South Rim of the Grand Canyon. The drive is stunning in itself and leaves you with many opportunities to pull to the side of the road for additional photos. But the real beauty comes when you enter the gates of the canyon and stop at one of the viewpoints. There is nothing more majestic or surreal than your first time looking out at the Grand Canyon, and it is an indescribable experience. Budget time to see as many sunrises and sunsets in the canyon as possible. After driving down into the Canyon we arrived in time for a short hike on the Bright Angel Trail and a view of the sunset from the Bright Angel Lodge. In the summer months most visitors backpack down into the canyon and spend the night close to the Colorado River. Because there was snow and ice on the trails and freezing temperatures we decided to walk the trail as a day hike and sleep in the comforts of a warm hotel bed. 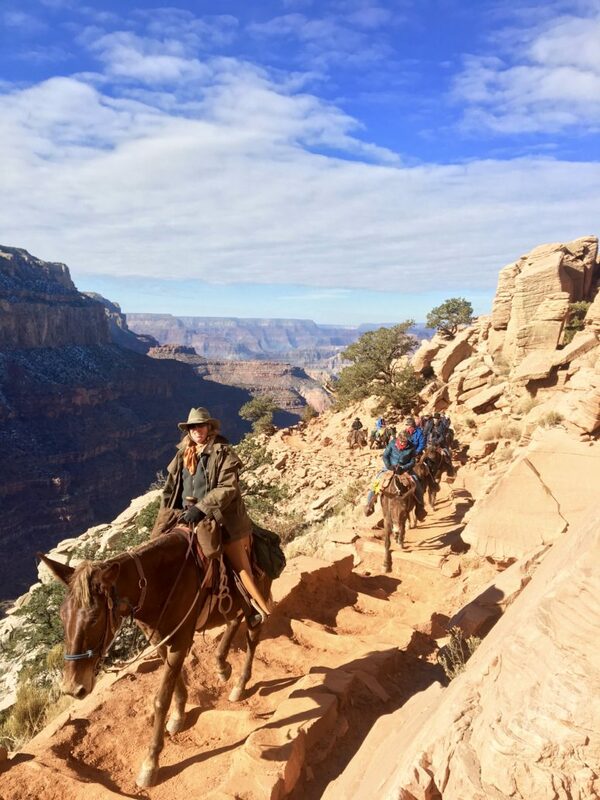 Either way the most popular trail is the South Kaibab Trail and can easily be a 3, 6, or 12 mile hike depending on your fitness level and interest in hiking. There are numerous viewpoints along the way for a quick photo or a lunch break, so plan to spend at least a few hours hiking through the canyon. 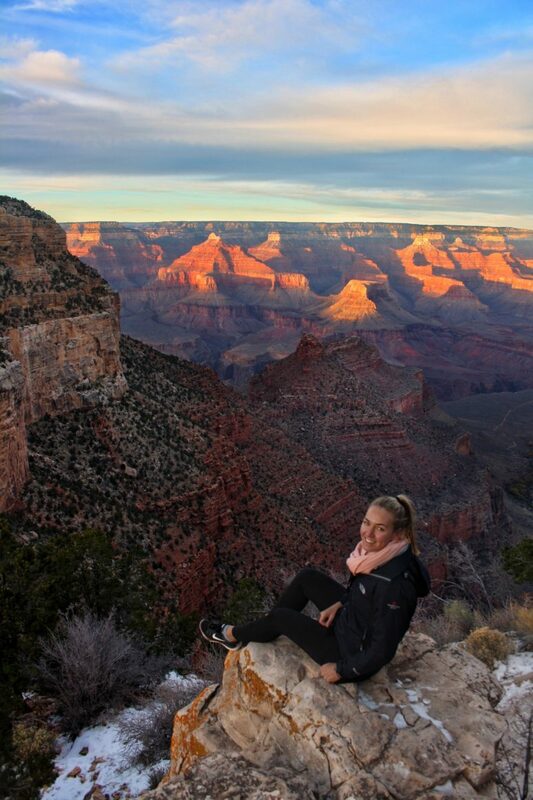 Return in time to watch the sunset on the top of the canyon and marvel in your physical ability to hike thousands of feet down into a canyon and then back up! 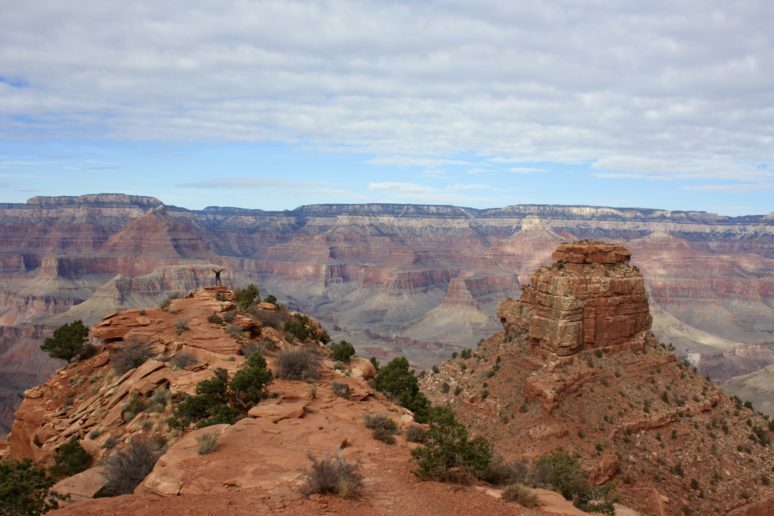 If you are a hiking fanatic it’s worth considering the strenuous rim-to-rim hike from the north to south rim (or vice versa). 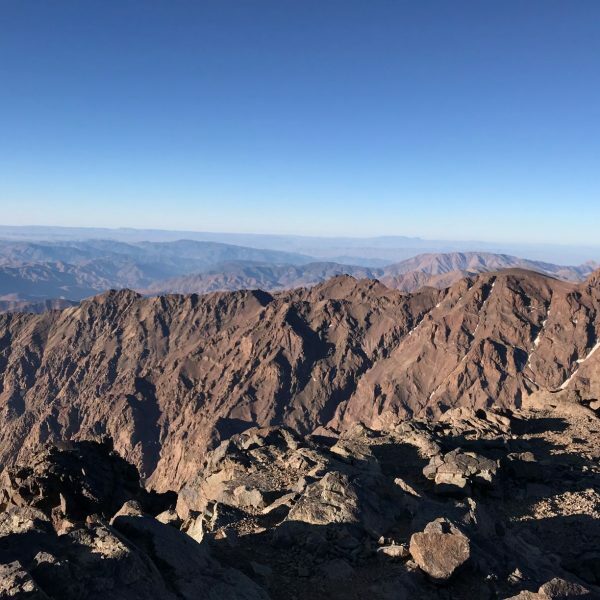 The trip can be done in 1 day but can easily last you 3 days if you are enjoying the beauty of the canyon and not eager to return up the trail. You can either camp at the bottom of the canyon or make a reservation at the famous Phantom Ranch. If you plan to backpack and spend the night in the canyon you will need a specific permit to do so, so plan your trip in advance! 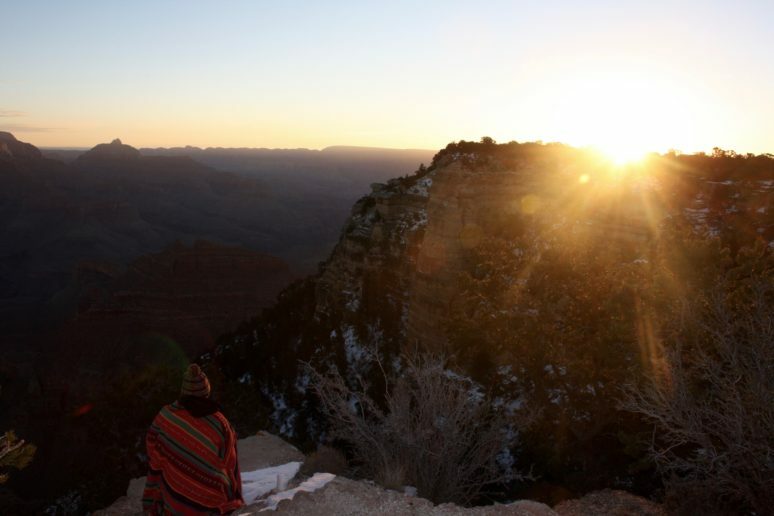 Both Yaki point and Hopi point offer stunning sunrise and sunset views, but can be quite crowded with tourists. Go early to stake out a good spot, or hike around the main point to find the best view. The National Park Service created a sunrise and sunset flyer to help you plan your viewings. 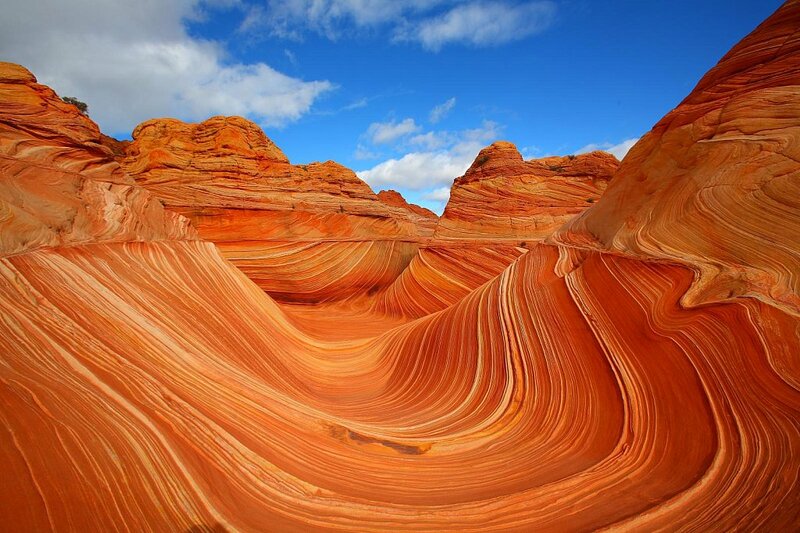 If you have extra time to sightsee near the Grand Canyon, I’d recommend looking into a photography tour of the Wave Coyote Buttes, Arizona. Photographers and hikers alike recommended both sites to our group, but more extensive planning is necessary to see both. For instance, all visitors to The Wave must have a permit and that permit must be acquired the day before going to the actual site. That means you will need to budget two days to actually see the site. Wherever you go in Arizona you’ll see a scaling view of gorgeous purple mountains, blue skies, and thousand upon thousands of cacti. Revel in the majestic beauty of the canyons and spend as much time as possible getting in touch with nature — you will not regret it! 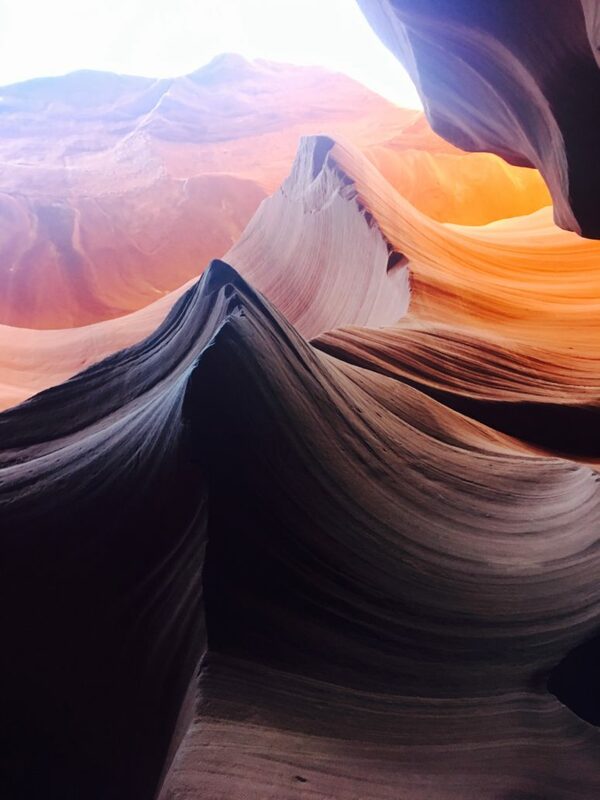 We hope that this article has inspired you to visit the Grand Canyon and Antelope Canyon. If you have any questions about the destination or have your own travel tips to share please leave these in the comments below. Do you have any hotels you’d recommend staying at in Phoenix or outside the Grand Canyon? Hi, did you book for Navajo guide before arriving there or you booked it on the spot? is it worth it to choose upper than lower for lighting reason? Thanks for this post! We have five days in starting in Phoenix, Arizona. Would you suggest two days in the Grand Canyon or two days in Page, AZ? And if you were to do it all over again, would you go to the Grand Canyon first or Antelope/Horseshoe Bend first? We are planning on going at the end of February. Did u ever go and if so what did you decide!? I’d like to know the same info since doing something similar in April 2018! This post was awesome! We only have 2 days in AZ at the end of Februrary but just for clarification you did all 3 in 1 day? It said 3 days in the initial paragraph and I wasn’t sure if maybe you just did other stuff the rest of your trip? I’m praying there’s hope we can do all in one day. Thanks for the tips! Hi – We are scheduled for the Grand Canyon Railroad on Friday 3/23 – Sunday 3/25. Thoughts on then going to see Horseshoe Bend and Antelope Canyon and where to stay once we get back to Williams – which is where the Grand Canyon Railroad station is? Did you fly in and rent a car to get to the canyon? If so what airport? 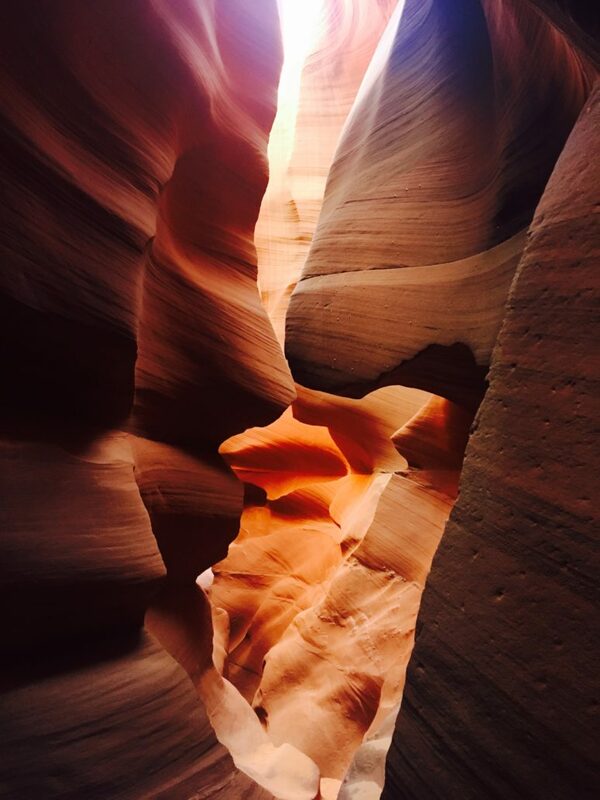 Do you have the name/website of the $20 tour that you took of the Lower Antelope Canyon? I’d really appreciate it as I’m only finding ones for like $50. Thanks so much for such an awesome post! Really helps me know what to expect when I travel there this October. Hello, we are planning to go to Grand canyon. we booked the flight to Phoenix do you have any recommendation of hotels to stay. we reach around 8:30 pm in the evening what to do in phoenix that evening. 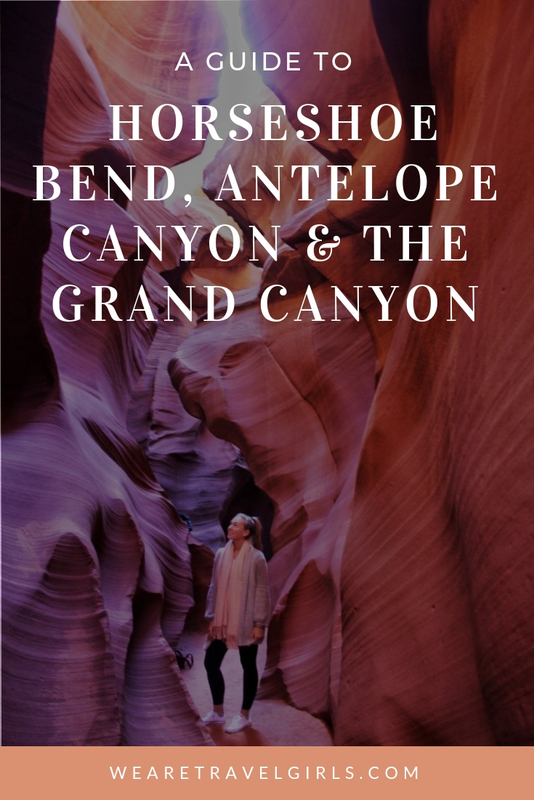 per your blog we should go to see horseshoe and then antelope canyon and then go to grand canyon.we are there for 4 days. we are going early march.